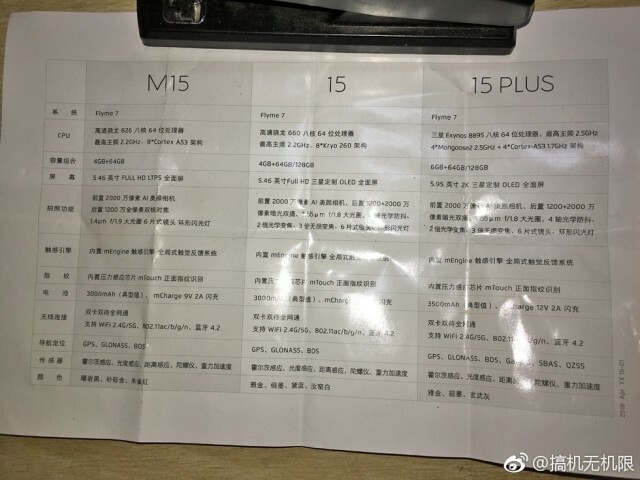 In the rush to prepare for Sunday’s event someone lost track of a brochure that neatly lists out all the specs for the Meizu 15, the 15 Plus as well as the Meizu M15 (the lite model). The Meizu 15 duo shares a 12 MP + 20 MP dual camera. The main shooter has large 1.55 µm pixels and a fairly bright f/1.8 aperture. The selfie cam is a single 20 MP shooter. Unavoidably, the cameras have AI features to enhance your photos. Both phones have OLED screens with 1080p+ resolution but different sizes – the Plus model has a 5.95” panel, the regular Meizu 15 has a 5.46” one. The Meizu 15 Plus is powered by the Exynos 8895 chipset of the Galaxy S8, and it’s paired with 6 GB of RAM and 64 GB or 128 GB storage. It has a 3,500 mAh battery with 24W mCharge (12V at 2A). The Meizu 15 switches to Qualcomm power, a Snapdragon 660 chipset specifically. It has 4 GB of RAM and again a choice between 64 GB and 128 GB storage. The battery has 3,000 mAh capacity. The Meizu M15 serves as the lite model of the group. It has a 5.46” screen with 1080p+ resolution, but it’s an LTPS LCD panel. And the chipset is a Snapdragon 626 with 4 GB of RAM and 64 GB storage. The M15 has a single 20 MP camera on the back (1.4 µm pixels, f/1.9) along with a 12 MP selfie camera. All three phones run Flyme 7, the Android version is unknown (actually, “Android” isn’t even mentioned on the brochure, it’s all about the custom skin).